After the traditional story so far recap, it was time for the first musical number of the evening. A funky although rather underwhelming start to this year's final as the 3 hosts performed "Skaka Den" backed by funk collective Damn! Funky yes, but final-class? Hell no! David and Hasse were in suits and Clara was in a lurex trouser suit. An upbeat beginning to tonight's line-up of songs, even if the initial momentum was very quickly lost and we knew that this wasn't going to be a contender. 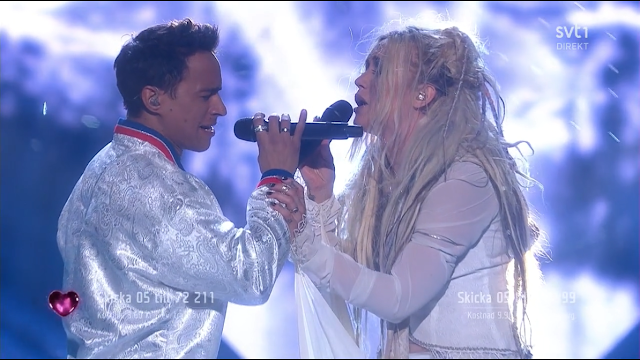 Which is a shame, as despite its title, "Wild Child" was for me the most accessible of her three Melfest songs. The floor dissolved Sergey-style after the middle eight. Ace proved once again that she was queen of the Melfest performance, even one as simple as this. 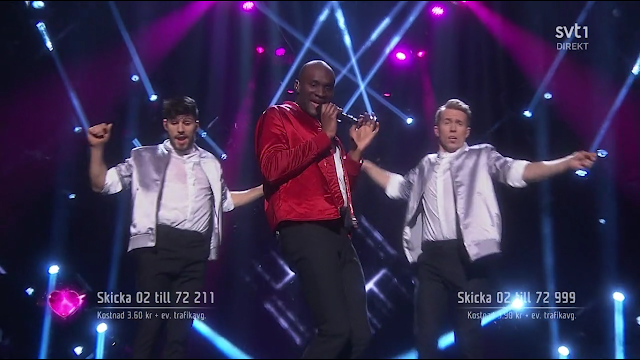 However, one of the things which has spoiled Melfest for me in recent years has been the reliance on pre-recorded backing vocals. These were particularly obvious on this song and Ace’s vocal shortcomings were shown up before the final chorus. "Her Kiss" - Boris René. No hat for Boris this year, but he was dressed in a red silk bomber jacket and tight trousers which were too short for him! His dancers were also in silver silk bomber jackets. Boris has a lot of charisma and the "likeability factor" and managed to hold my interest. 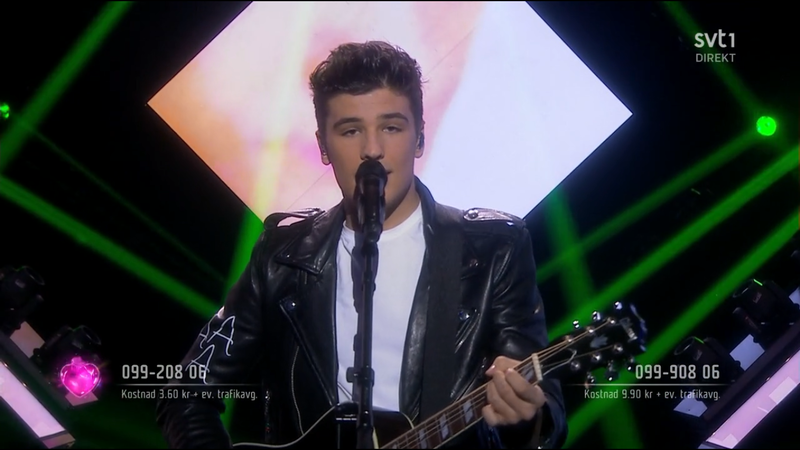 He may be the whipping boy of the Melfest fandom but I like him, and I liked this song a lot more than I probably should - although not as much as last year's song about the little box/litter box/letterbox but it's still quite decent, and the writers have been a regular fixture in Melfest over the past few years as well. Which precisely summed up my feelings about this song. Although it must be said that she doesn't get the most favourable draw positions - 2nd last year and 3rd this year. I can’t believe Ola Svensson had a hand in writing this. Not his greatest moment was it? Horrible styling and staging. Bad language isn't big or clever, I don’t know what story it was trying to tell. The nasty girl image just doesn’t fit well with her. Last year's song was infinitely more preferable to this one. I feel she really needs to rethink who she is as an artist, and come back in a couple of years with something more substantial. 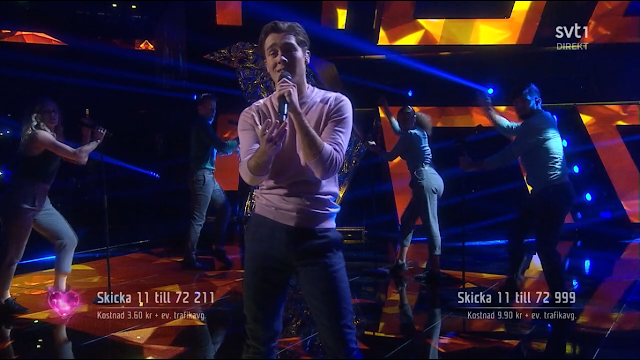 Next up, a parody of the phenomenally successful Norwegian teen drama Skam, or as it was called here, Smak - featuring a guest appearance from Alexander Rybak (below) who seems to have popped up everywhere during national finals season this year. Clara changed into a navy blue sequinned gown in time for the next song. Well, he remembered to sing freakin' rather than f*****, as it had now been “cleaned up”. It was a very slick and professional show, and major credit to Robin and his crew for managing to dance on treadmills, but the vocals weren't that great. The whole package just left me cold, and the most annoying thing about it was that stupid hand signal. Actually, there were a lot of annoying things about it...! Was it a song or a fashion show? “En värld full av strider” – Jon Henrik Fjällgren and Aninia. Unfortunately I can't listen to this now without thinking of the Norbergs' ski-ing parody. They looked good together although they spent much of their time apart on stage. There was a talky bit and a joiky bit and a great big singy chorus by Aninia who I’m sure will return to Melfest in her own right at a later date. My main criticism remained that it just got too shouty towards the end. But it was very pretty and wintery and filmic and staged in epic fashion. They hugged at the end. Awww. “Kiss You Goodbye” – Anton Hagman. 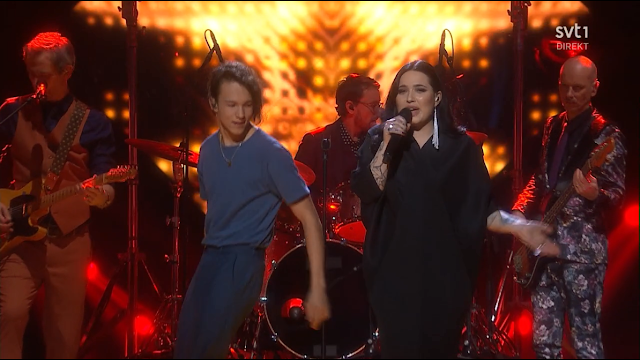 How must this young guy have felt, with all that criticism since Andra Chansen for daring to take Loreen’s place in the final? But he won that vote so he deserved to be there as much as anyone else. Like Lisa Ajax, his image dominated the back projection screen and that’was a bit too much of an egotistical touch. The chorus was catchy but the main problem remained that this song is not his own, for it is instead “Stitches” by Shawn Mendes. “A Million Years” – Mariette. She is a charismatic and genuine performer. The circus show going on in the background was a bit too distracting and unnecessary (quite unsettling too as at points they looked as if they were hanging themselves).as Mariette is such a compelling performer she didn't need all that. One of the genuinely good songs in this year's Melfest - and there weren't many of them - and one which I would listen to long after the contest was over. “Gotta Thing About You” – F O and O.
Pee break time sorted then. Even the songwriters couldn’t be arsed to turn up, so why should the voters be arsed to listen or vote for it? 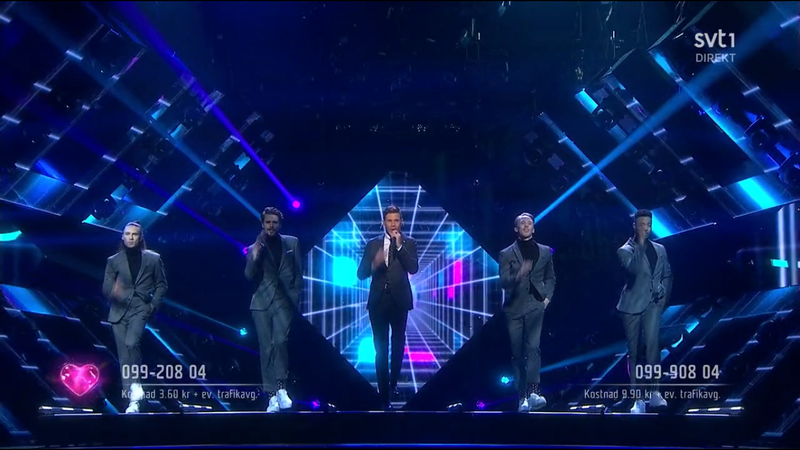 Sorry boys but this for me was one of the worst songs to grace a Melfest stage in years, with no appeal whatsoever outwith their vociferous fanbase. Written by Nano and a cast of thousands yet this ended up sounding very much like a Hozier/Rag N’Bone Man/Sigma mash-up. The staging started in shadow and then exploded into light at the chorus. Check out that burning app heart - there was no doubt that this was going to be a big hit with the televoters. This wasa quality modern song and deserved success. It would have been interesting to see how this would have done if it had got the ticket to Kyiv. I think this will be a good starting point for his music career and I'm curious to see what else he will come up with. “As I Lay Me Down” – Wiktoria. 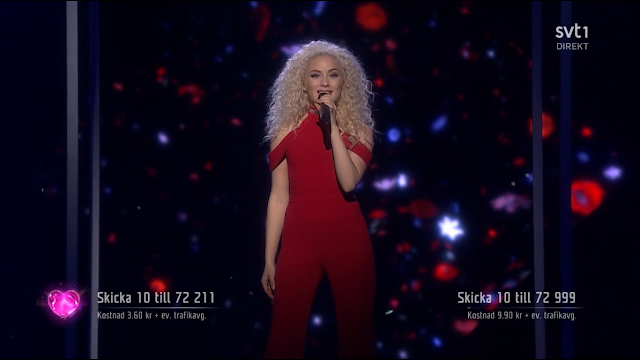 For the final, she swapped her dress for a red catsuit. 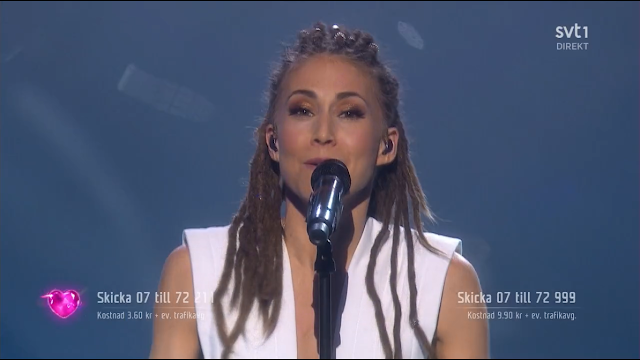 Wiktoria strikes me as a 21st century Carola who will make multiple appearances in Melfest and will keep going until she wins the thing, and then she will keep coming back again after that. My problem with her is that she also oversings like Carola. So it was all a bit too shouty/shrieky for me, and the staging with the metal “bed” was still a little too clumsy. I preferred this song to "Save Me" though. Part 2 of “Smak” and then it was time for one of the more understaged efforts this year. “Good Lovin’” – Benjamin Ingrosso. 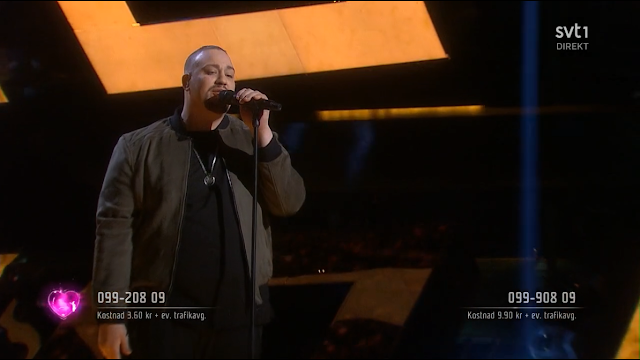 With not much more than a tinfoil backdrop (which again I can't watch any more thanks to the Norbergs' parody) and Benjamin dressing down for the occasion in his jumper, he delivered a slick enough performance of this rather lightweight pop song with Justin Timberlake influences. It did better than I thought it would, particularly with the juries. I wonder if he'll follow his mum's example and make a few more Melfest appearances in the future? “Boogieman Blues” - Owe Thörnqvist. The novelty to end all novelties, yes, but this was a fun song packed with personality. Owe managed to make it through his big number and could walk away with his head held high. Another great achievement in a long career. I don’t for a minute deny him his place in the final. That’s what Melfest is about, there is always room for a long established artist as well as the new up and coming names. All 12 songs have been sung and it's now time for a quick interview with Zara Larsson. Would that be the same Zara Larsson, whom I recall some years ago on her journey up the ladder to worldwide fame, said words to the effect that she basically wouldn't touch Melfest with the proverbial bargepole unless her career was doing down the dumper? But I guess that a special guest appearance is ok to plug her songs then? Recap time and then off to the green room for David's movie medley of power ballads. That boy can certainly sing. And Robin, be very afraid. 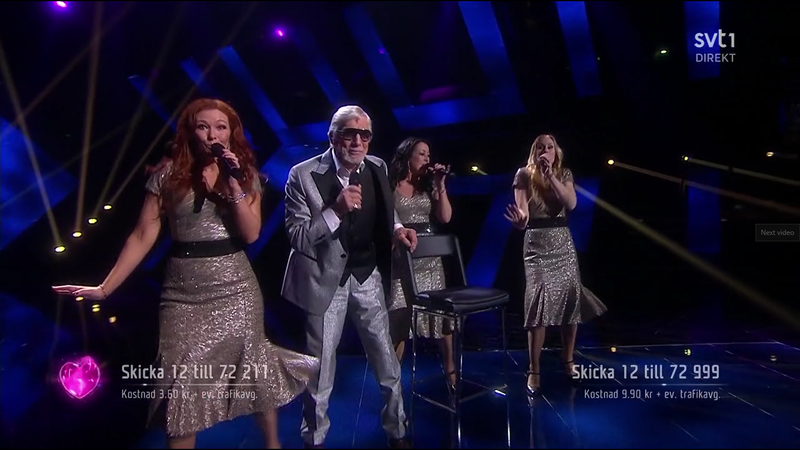 Of course Melfest wouldn't be Melfest without an unusual cover version of the previous year's winner. This year it was the turn of Damn! who opened the show, performing a jazzy version of If I Were Sorry, featuring Shirin, who was a little reminiscent of Amy Winehouse, and then Frans joined them for the end of the song. Frans has been quiet over the past year and hasn’t capitalised on his Melfest 2016 win: instead he’s been focusing on his studies. This year's international juries came from Poland, Czech Republic, Norway, Italy, Malta, Israel, France, Australia, the UK, Armenia and Ukraine. There was no obvious favourite with the 12 points being shared between Robin, Lisa, Jon Henrik and Aninia, Nano, Benjamin and Mariette. although Robin had the most 12s (from 3 juries). Benjamin's song did surprisingly well in the jury vote but Wiktoria's song was probably the biggest jury flop as it was one of the original frontrunners to win. Televote recap and then a rather ill-advised interval act song from the 3 hosts which was like a parody of an 80s movie song and had lyrics like "din mamma jobbar inte har" or something, and I just didn't get what they were trying to do. I am going to miss Hasse's wonderful accent even if I didn't understand a word over all those weeks. His "nio nio nio" when reading out the televote numbers was a classic. He also introduces the next interval act, the one and only Showra Lowson. You know Showra - she's had a lot of chart hits over the past couple of years and she was going to perform a couple tonight. OK then it's actually Zara Larsson which in Hasse-speak is Showra Lowson! 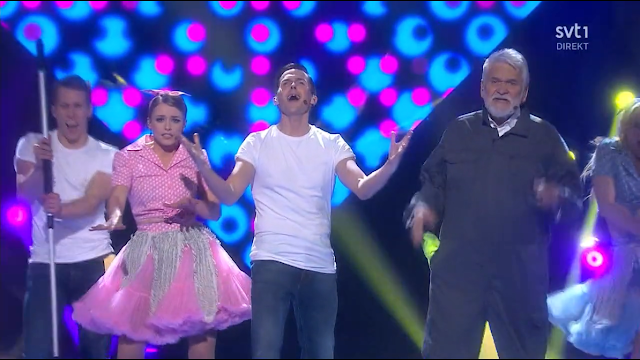 Firstly a ballad, "Only You", and then she moved on to a medley of "I Would Like" and "Ain't My Fault" which provided enough time for a change of clothing for Clara and David to announce the final televote results. 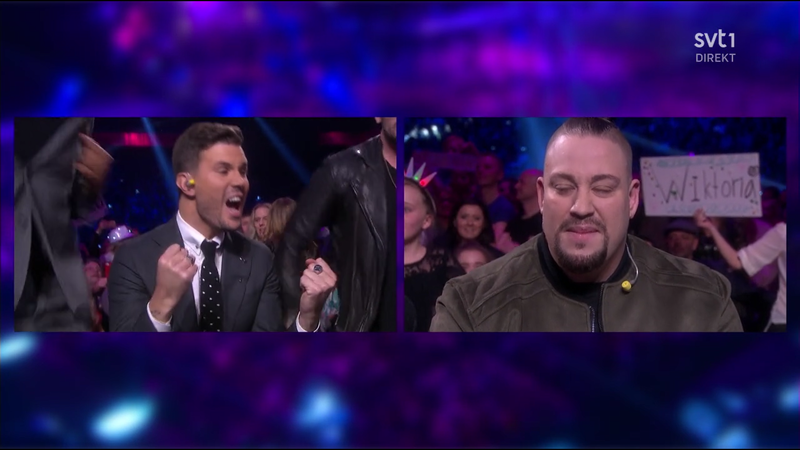 Melfest's exciting jury and televote announcement always ensures an exciting end to the evening, and this voting system has now been introduced to very exciting effect in the Eurovision Song Contest to great effect. Not for the first time did the final results of the jury and televote differ. What was very noticeable this year, like last year, was that the televoting percentages were all very close and that there was no runaway winner. Although Nano topped the televote with 11.9%, when this was translated into points it wasn't enough to beat Robin Bengtsson, who only came 3rd in the televote but the combined total was enough to send him, complete with his treadmills and Dressmann ad polo-necked sidekicks, to represent Sweden in this year's Eurovision Song Contest in May in Kyiv. 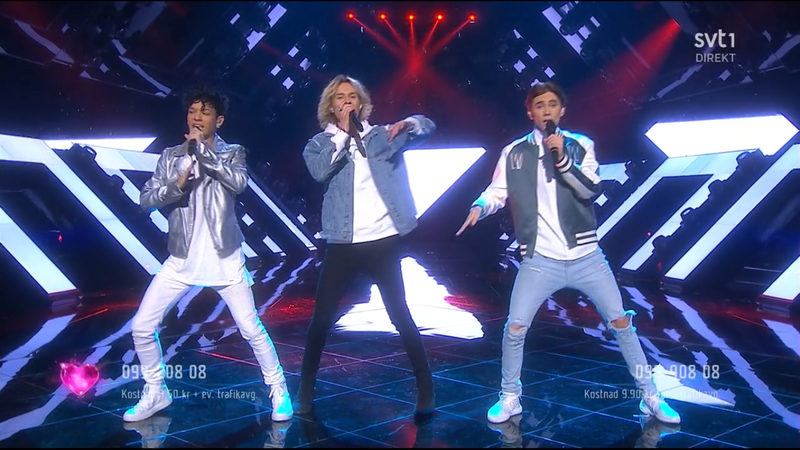 For me, the whole Melfest 2017 experience left me feeling a bit underwhelmed, a bit like last year., although I thought the presenters were an improvement even if many of those musical numbers fell well short of greatness. The contest no longer creates long-term stars and increasingly for many artists, they don't have any kind of career outwith Melfest. This seems to create a rather stagnant and below-par contest where certain people can be relied upon to compete, with the content being secondary. Being the old-school fan who's all about the melodi, I would like to see an improvement in the standard of songs at Melfest. 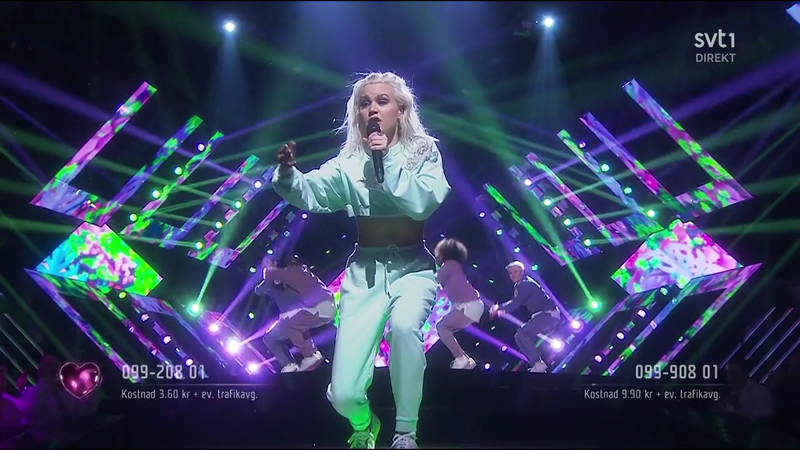 Sweden has a reputation for slick, well-produced pop music; but Melodifestivalen no longer seems to deliver the quality it used to. It may be Europe's biggest and best national selection, but it now needs better songs if it is to maintain that reputation.